We can clean any type of rug from Persian/Iranian, Afghan, Moroccan, Indian, Chinese and Tibetan rugs, with any type of rug fibres, including silk, art silk (also known as artificial silk), wool and synthetic. Each rug is inspected for any pre-existing conditions. 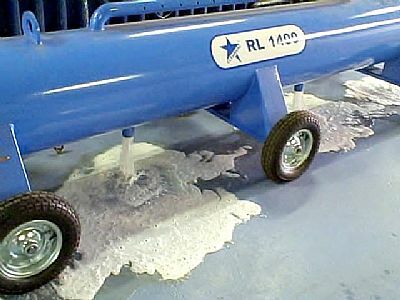 In most cases soil covers up variations in dye (abrash), fibre staining, prior dye bleeding, worn areas or white knots that become “uncovered” after the wash. Some of these are weaving characteristics (abrash and white knots), and others are damage that can possibly be repaired or reversed. The dyes of your rug are tested for colour fastness. 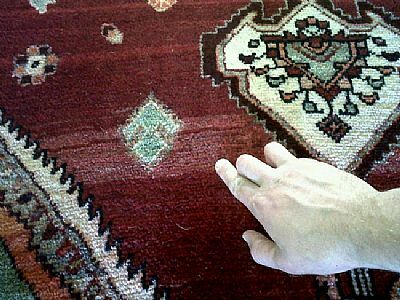 If the dyes are not colourfast, then the rug is prepared by setting the dyes. 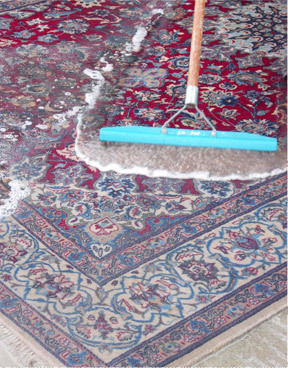 The pre-wash inspection allows us to choose the correct method of cleaning for your precious rug. 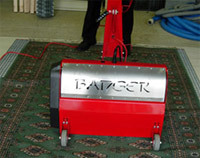 The rug will be vacuumed first and then a vibrating system machine which acts like an “army of gentle rug beaters” will carefully loosen the deep down dirt out of both the front and backing of your rug. This machine will gently remove the dirt from your rug with 40,000 gentle harmonic vibrations per minute… that means your rug will receive over 1 million gentle dirt loosening-vibrations during its massage. 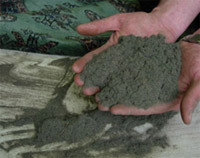 By removing the dry soil, chances of the rug wearing out prematurely will be greatly reduced. Your rug can also lose up to half its weight! The rug will be submerged and given a cold water shampoo bath, using soft brushes for mild agitation. 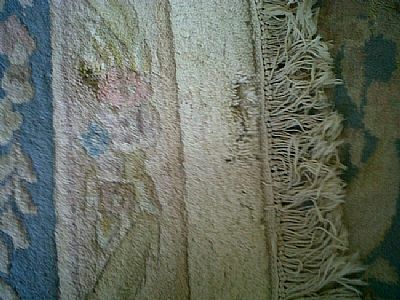 The rug is soaked depending on how much surface soil needs to be worked out and rinsed from the rug’s fibres. 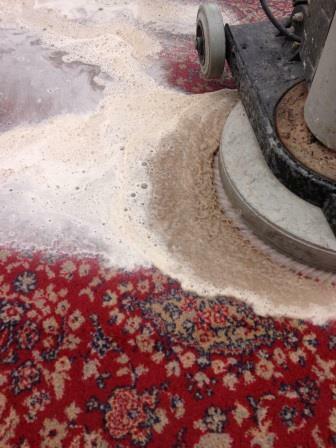 Removal of all cleaning and soil residue by means of a clear water rinse is vital of achieving a thoroughly clean rug. The rinse process utilises clear water at a gentle flow rate to ensure the rug is left without any residue after the cleaning process. 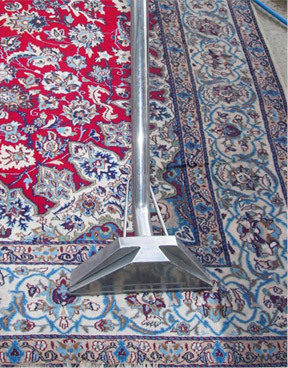 This ensures that the drying of your rug is speeded up 10 times compared to any other method used by other cleaning companies. This totally eliminates the chance of mould growth, colour run, browning and any other issue associated with a sloppy wet rug taking weeks to dry. This form of extraction is unique to this area! Air movers and dehumidifiers are used to help facilitate drying, without the use of high heat (so there is no worry of shrinkage). 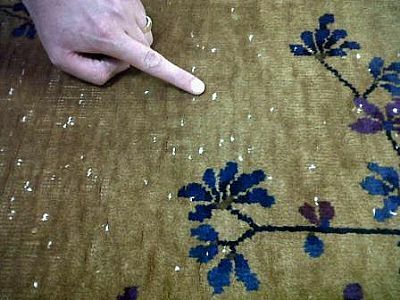 Upon a first wash, it is typical for a rug to shrink slightly (less than an inch) – just as cotton and wool clothing does in even a cold water hand wash. And as with throwing wool or cotton in a high heat dryer, you know this shrinks natural fibres…this is why rugs entrusted to our care are dried this way. So, have a rug that needs attention?